Dodgers Blue Heaven: Blog Kiosk: 9/27/2018 - Dodgers Links - Ugh! Blog Kiosk: 9/27/2018 - Dodgers Links - Ugh! We're not out, but it sure don't feel good. Last night the Dodgers failed to win their series against the Diamondbacks, losing 7-2 to win just one-of-three games in Phoenix. So, now they enter their last series of the year - a three game set - against the Giants with the season on the balance. Fortunately, we still hold a one game lead for the last wild card spot, but I would much prefer to win the division. On a side note, this last series against the Gnats is sure to be exciting. I hope my heart can take it. In hopes of providing inspiration, please check out the above fantastic October 2, 1955 International News press photo taken by the legendary Herb Scharfman. 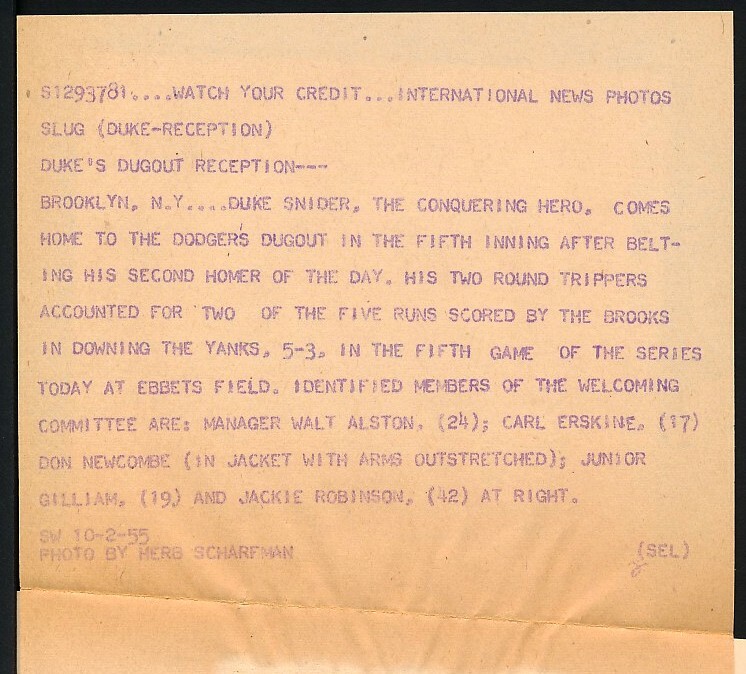 It features a celebrating Dodger dugout and our slugging centerfielder, Duke Snider, after his second homer of the day during Game 5 of the World Series. This Day in Dodgers History: In 1936 future Dodgers Hall of Fame skipper Walter Alston played in his only Major League game. 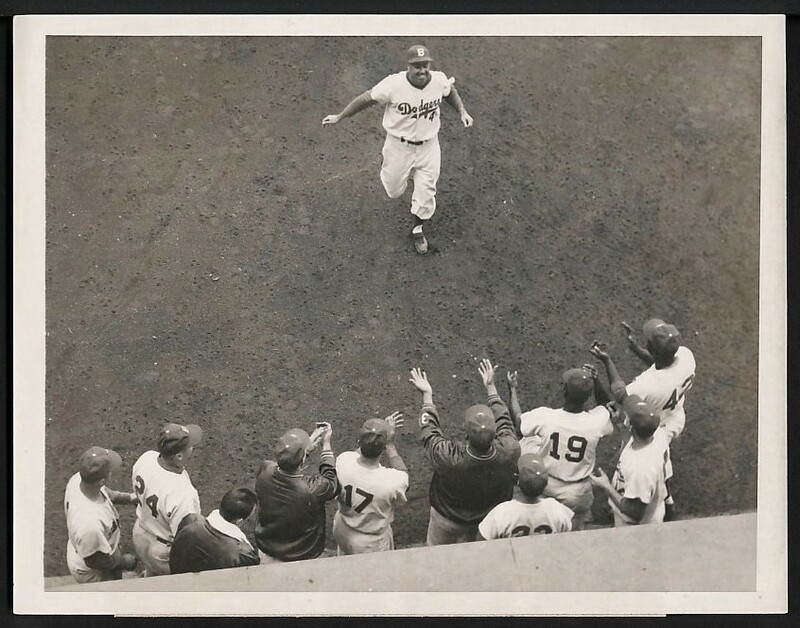 It was as an 24-year old first baseman for the Cardinals, and he got into the game as a late-inning substitution for Johnny Mize. 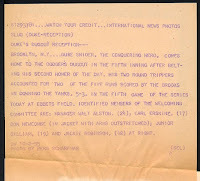 He would commit an error on the field in two chances, and only get a single at-bat -- he struck out. In 1951 future basketball Hall of Famer Bill Sharman was on the bench for the Dodgers as a 25-year old prospect. 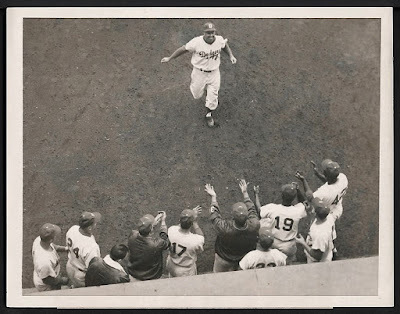 On this day he would be thrown out of the game, along with 14 other teammates, for "bench-jockeying" after a close play at home. He would never get a chance to play a Major League game, and thus became the only player to be ejected from a game without ever appearing in one. In 1961 Sandy Koufax recorded seven strikeouts against the Phillies to set a new National League record for strikeouts in a season at 269. The mark was previously held by Giants hurler Christy Mathewson who set it in 1903 with 267 strikeouts. 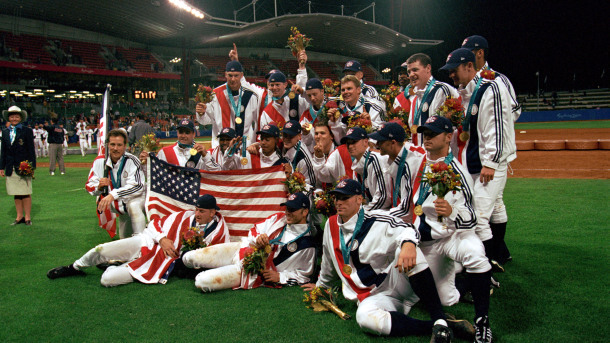 In 2000 the Team USA Baseball club, skippered by Tommy Lasorda, beat the Cuban ballclub to win the gold medal in the Olympics. Happy Birthday, Joe Visner, Doug Baird, Whit Wyatt, Len Matuszek, Jason Phillips, Vicente Padilla & Jon Garland! Podcast: True Blue LA -- Podcast episode 1822: Dodgers playoff roster predictions (Podcast Link). Per Ron Cervenka at Think Blue LA; "Giants fans are in for a surprise on Saturday – 294 of them." Per Ken Gurnick at MLB.com; "Hatcher was unsung hero of 1988 title team." Tim Rogers at Dodgers Nation interview a Dodger prospect: "An Interview With James Outman." Dodgers Nation: What are some of the adjustments you’ve had to make on the field going from college baseball at Sac State to Ogden? James Outman: One of the adjustments that I had to make was getting used to playing every day. In college, you can play a game and then you have to sit on the outcome, good or bad, for a few days. It was kind of refreshing being able to play a new game every day so that I could focus on the next day. Getting used to playing everyday was a mental adjustment that I had to make, but it was not terribly difficult to get used to. It was either I made the adjustment or struggled because of it. Tracy Hackler at Panini's The Knight's Lance shares even more pics from their 2018 National Treasures set. I hope to have pics of most of the Dodger cards next week. In the meantime check out a couple of cool Dodgers' booklet cards that can be found in packs below. Yesterday, Topps issued a 2018 Topps Now card that happened to have Clayton Kershaw on it -- although it wasn't really about him at all. As you know, Kershaw recorded 301 strike outs in 2015. 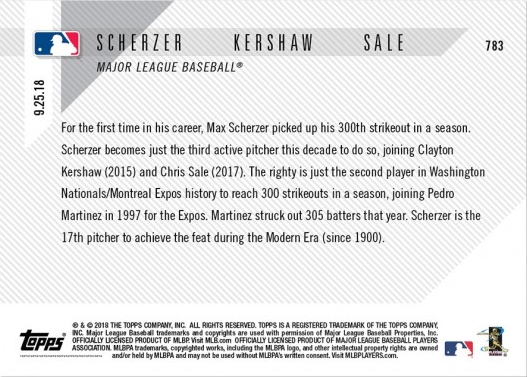 Well, Max Scherzer of the Nationals recorded his 300th strike out of the season the other day -- being only the third pitcher this decade to have done so (Chris Sale being the other) So, Topps saw fit to issue a 2018 Topps Now card in his honor. 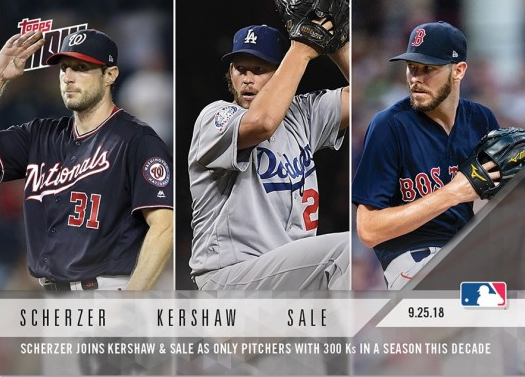 As you can see, the card also includes a pic of Kershaw and Sale. Go here to check it out and order.